Did you know that a number of people read the ending of books first to decide if they will read the story? When you are writing an article, what do you put at the end of your article that would make that kind of reader jump to the beginning of the page to read every word you wrote? 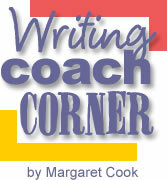 The Writers’ Coach column features a series of articles about writing for the Next-Step-of-Faith. Recently, I have given you ideas about writing a great lead at the beginning of your article, keeping the middle focused and filled with momentum and this article will talk about ending the article in a way that starts the reader in a direction they may not have expected. (The next issue we will look at giving titles that attract readers). Think about the reader as you write. What would prompt her to read more articles by you on the website? The longer a reader spends time with us on the website, the more opportunity we have to tell the story of God at work in our lives. Part of this testimony is to encourage writers to prepare compelling accounts of God at work in a personal narrative. We pray for our writers and we plan to help each one become successful in writing to glorify God and chronicle testimonies that make a difference in life. When you are planning to write an article, think about the beginning and the ending before you start. Both are very important. The beginning draws the reader into the article and the ending leaves them somehow changed or in a different place spiritually. How does your ending promote an action, a question or a change of heart? Were there any important clues in the introductory paragraph or in the middle of the article that the reader will need you to use. Some endings are very satisfying. There is a feeling of completion to the article. Other writing can create uneasiness at the end of the article and send us on a quest of some sort. Many different types of windings can be effective. Think of some of the books you have read and read through some of the articles on the Next-Step-of-Faith website to compare some of the different styles of ending. Have you seen some of the children’s books that have multiple endings? The reader chooses one of several outcomes. On your next article, try writing three different endings. Each one should prompt the reader to take a Next-Step-of-Faith. Send us all three endings and we will help you pick the one that is most compelling. Begin with the end in mind and end in a place that points the reader in a new quest of faith. Copyright © December 2007 – Margaret Cook. All rights reserved.